In today’s changing global environment, alternative energy sources are more important than ever. Scientists are constantly experimenting with new ways of harnessing energies to produce electricity and power. 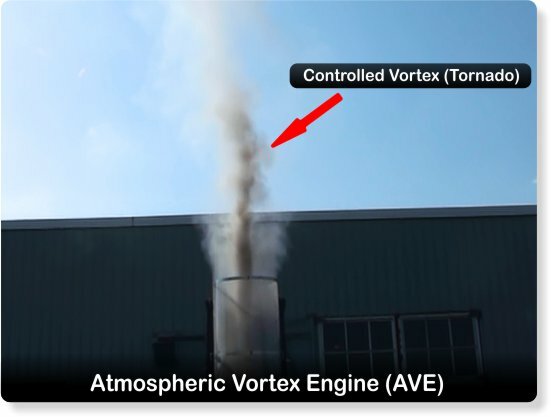 Electrical engineer and president of AVEtec Eneregy Corp., Louis Michaud has received funding from PayPal cofounder Peter Thiel’s Breakout Labs program to build an experimental Atmosphere Vortex Engine (AVE). The $300,000 in startup funds goes towards building a working engine to dispel or prove the viability of using such technology to produce electricity with virtually no carbon footprint. Mr. Michaud has been investigating the idea of harnessing the power of tornado’s to provide electricity for several decades but until now has had problems being granted funding. This green energy production process has the potential of meeting a large portion of human energy needs. 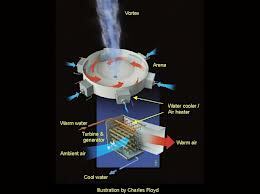 The AVE concept is to use a fan to blow some of the excess heat produced by conventional power plants, into a cylindrical hollow tower, at an angle. This creates a circular air current, which grows stronger as it moves higher. The higher the vortex goes the more energy it draws due to differences in temperature. The result would be a controlled man-made tornado. 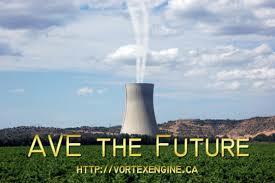 Turbines would be installed at the base of the vortex to create electricity. When the prototype is built, the tests will be conducted at Lambton College in Ontario. The tower will be 131 feet tall with a 26 foot diameter, enough to create a vortex about a foot in diameter which would power a small turbine. This potential method of producing energy would cost about 3 cents per kilowatt hour, versus the typical 5 cents costs for coal plants. While I think this method has great potential to produce clean inexpensive energy, the risks of creating a controlled tornado are perplexing. Imagine the devastation and environmental catastrophe, if the tornado became unmanageable and destroyed the power plant it was using for energy.